There is no better way to teach children about water safety than by investigating some water safety coloring pages. This activity helps children learn stay-safe smart practices, while having fun at the same time! Fun: Children tend to be more relaxed and receptive to safety information and practices while they are having fun. This is especially true while their happily choosing colors to fill in the exciting shapes the'll see in a coloring book. 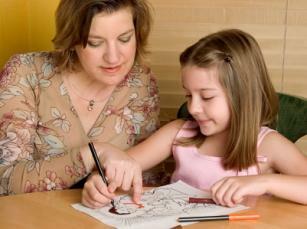 Great time to teach: Teaching a child water safety tips while they color is a great idea. You get the opportunity to teach in a non-threatening way (the information won't scare the child) and you'll still be able to get across the importance of these tips, and the consequences, of not following them. It takes time: Few children will finish coloring a coloring book in one day, and this works in your favor. This means that over the course of a few days, you can sit and work with the child while their coloring; reinforcing all of the information they've been learning. Also, remember to ask questions about what the characters in the coloring book are doing, what they should be doing, etc. This way, the child will begin to make a connection between his coloring, the character and their water safety tips. Today, for our purposes, we'll focus on their Water Safety Coloring Book. The opening page of this book features a duck dressed as a forest ranger of some sort, and a beaver who just wants to have fun (i.e. forgets or doesn't want to follow or listen to the rules). The duck begins by saying that there is something very important that he wants to discuss with the beaver today. The adorably oversized beaver provides the comic relief by saying, "Yeah! Fun at the Lake!". The duck then goes on to explain different water safety rules. He also explains why certain tips, like the buddy system rule, while a good idea, sometimes doesn't work. In short, this is a great water safety coloring book that you and your child will love exploring! Aqua Duck's Fun Page is another great online site you can turn to to find age-appropriate water safety coloring pages. Once there, you'll find coloring pages entitled "When Taking a Bath, Don't Use a Full Tub". You'll also find an entire section of the site devoted to the water cycle (this section details the natural cycle of evaporation, condensation and precipitation in a child friendly, fun and relatable way). In short, printing out a few (or all) of these coloring pages will go a long way in keeping your child active, occupied and happy. Moreover, they'll learn all about staying safe in a swimming pool, playing nicely and carefully around water, and what to do if a problem occurs. What could be better than that? You can also find more safety related coloring pages on LoveToKnow, like these fire engine coloring pages!